Yesterday I came across a blog that just touched my heart. Grandmothers are so dear. I find you never have enough time with them. They have so much knowledge and wisdom you just cant soak it all in. I lost both of mine in the past few years. I treasure all of the sweet memories. Although they were different in many ways they both seemed to be the perfect "Grandmother". One, very tall, proper and poised. The other, very petite,gentle,and soft. Each perfect in my eyes. They both seem to bring out the best in me. I hope I can pass down a little bit of each to my girls. After reading that sweet blog it tugged at my heart to gather some of my memories. Searching in the attic I came across some of my Grandmothers things. Im not sure what to do with them but it was just nice looking back. My daughter even enjoyed going through our treasures. This was just one of many boxes. Thought I would share with you a few things. Any good ideas on what to do with these neat patterns? Hope you enjoy! I have my Grandmother's old "sewing maching" I can still see her working at it...it's an antique....probably her Mother's. It is an old Singer in a wooden cabinet and my sister and I used to "pump" the grate at the bottom of it (it was foot operated) that made it work and she would get so mad at us! HA! We didn't realize then that it actually made the needle go "up and down" and that is how she sewed. We were little. It had drawers in it so I have many of her sewing "notions." 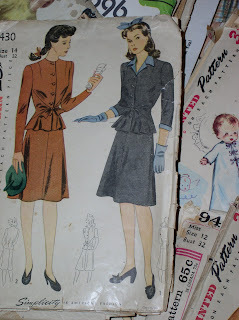 But I didn't get any of her patterns. I bet she just made them up in her head or made her own. How nice that you have your Grandmother's things too! We sometimes don't realize "what we have been given" when those things are passed on to us, until we get a bit older and can appreciate them really. Have a GOOOOD day. It's drabby and cold out here...blah! How's your Daddy doing? I'm thinking of you all. These pictures sure brought back memories. 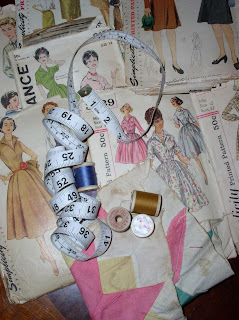 I've been sewing almost as long as I can remember. I had a lot of patterns that looked like these. I remember I liked McCall's patterns better, but I had a lot of Simplicity. 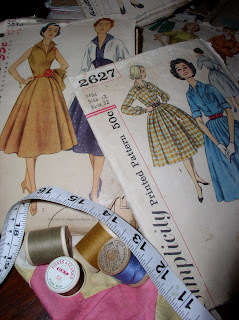 I loved to look at the pattern books. 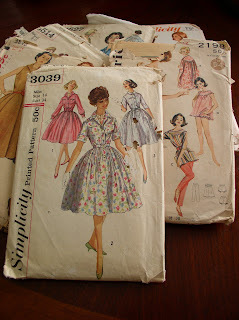 They still have them, of course, but I don't do much sewing now. After the doll clothes sewing kick I haven't sewed hardly at all except to make curtains and pillows. It's good to know how to sew. I know exactly what you are talking about!! I loved my grandmother so much....Today was a sad day for me Susie - I remembered so many things she said, or did....I have a few really sad days each month still -I wish we could see our lost ones again, Don't you? I think we all will, someday. We will see each other again - and won't it be the sweetest reunion? Just smile for Pete's sake!!! What a wonderful place to visit! I think I did it!